My Beatport DJ chart February 2015 is available! This month I’ve prepared a special classics mix: Adam White – Best Of Vol.1. This cd-mix is done by myself and I got a little bit of help with the mastering by Adam himself. Special thanks to him! Stream+Download enabled, enjoy! Tic Tac Trance #086 Replay available! It’s also available on Mixcloud.com/TicTacTrance for streaming. 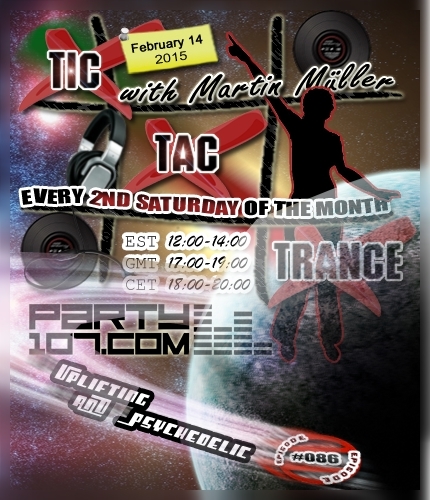 Tic Tac Trance returns on February 14 2015 with episode #086 on Party107.com. You can expect for this show a 2 hours uplifting & psychedelic underground trance mix which features tunes of labels like Blue Tunes, Future Sound of Egypt, Subculture, Always Alive and very selected tunes from Blue Soho’s Soholand compilation (and as always: many, many more tunes)! Make sure to tune in! My show airs TODAY at 18 CET / 17 GMT / 12 EST. Check out your local time HERE! Live tracklist during air time HERE!